WASHINGTON — U.S. Sen. Harry Reid announced Friday that he will not seek re-election, a decision that signals the oncoming end of an era in Nevada and scrambles the political landscape in the state and in the nation’s capital. Reid, 75, badly hurt his right eye and suffered at least three broken ribs in a freak home exercise accident on New Year’s Day. In a farewell video he posted to his website, he wore a set of glasses with a frosted lens to shield his damaged eye. Reid maintained his decision to retire was not linked to health concerns, nor to the prospect of facing an uphill re-election campaign in 2016. The lightning rod attached to Reid has grown only taller in recent years as the Nevadan presided over a Senate riven by partisanship. Discussing his decision on Las Vegas’ public radio station Friday morning, Reid received a surprise caller — President Barack Obama. “Well, I’ll be damned,” Reid said, one of the few times that the practicing member of The Church of Jesus Christ of Latter-day Saints has been heard cursing in public. “When the story is written and when all is told, you are going to have somebody who has done more for Nevada and more for this country as anybody who has been in the Senate,” said Obama, whom Reid had tipped off Thursday night. “There were a lot of folks who were slicker and who give smoother TV interviews, but in terms of somebody who has heart and who cares about ordinary people trying to chase the American dream, I don’t think there is anybody out there ever,” Obama said. Arguably the most powerful politician in Nevada history, Reid will retire after more than 30 years in Congress, including two terms in the House. He served eight years as Senate majority leader, and now is minority leader after Democrats lost control of the Senate in November. As Reid prepares to depart, he also signaled his preferred successor as Senate party leader and as U.S. senator representing Nevada. Reid said he would back Sen. Chuck Schumer, D-N.Y., to lead Senate Democrats. Reid and Schumer, presently the No. 3 leader, grew close during the two terms the New Yorker headed the Democratic Senatorial Campaign Committee that cemented Democratic control of the Senate and ensured Reid’s post as majority leader. Reid also said he will encourage former Nevada Attorney General Catherine Cortez Masto to run for his seat. Until Friday, Reid publicly had insisted he would run for a sixth term. 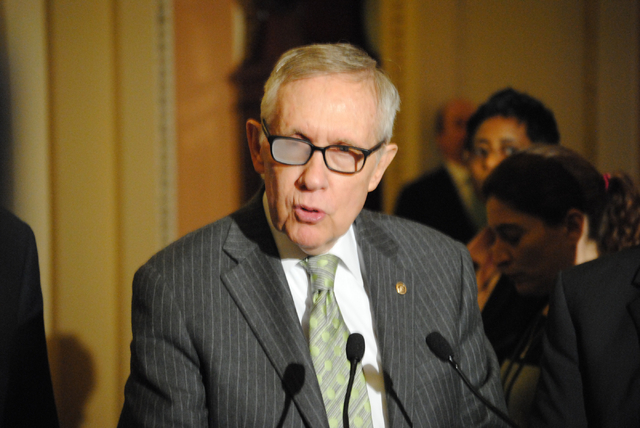 In his farewell, Reid said he would focus this year on working to regain the Democratic majority in the Senate. Reid, who grew up in the hard-rock mining town of Searchlight, said he considers himself fortunate to have been able to reach the lofty Senate and serve Nevada for decades. Contact Review-Journal Washington Bureau Chief Steve Tetreault at stetreault@reviewjournal.com or 202-783-1760. Follow @STetreaultDC on Twitter. Contact Laura Myers at lmyers@reviewjournal.com or 702-387-2919. Follow @lmyerslvrj on Twitter.